Well folks it's been a while since I posted anything, busy you know, but here it is the electrified sidecar bike. In between my last post and this I have had several EVs (not worth going into) and now this. It has a brushless hub motor and three 48volt battery packs. I have put over 70miles on it since I converted it about a month ago. It is heavy and scary unless you have about a hundred pounds in it. I decided that I wanted an electric scooter so I looked around and found an old push scooter that I had converted to be a dirt scooter. that was to be my base. 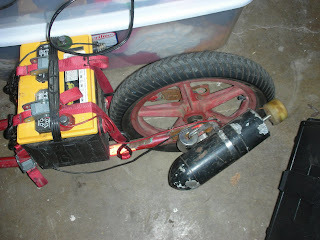 Next I found an electric trolling motor(just the motor) I sawed the fin off of the motor body. 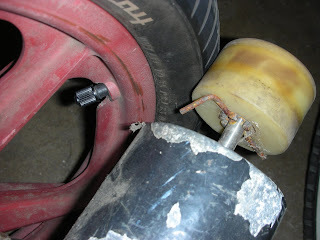 I attached a rollerskate wheel to the prop shaft, used a hose clamp and a large socket to tension the skate wheel agianst the side of the rear tire . 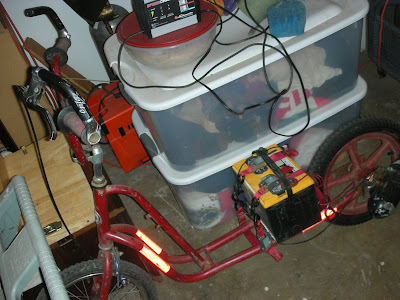 Then I cargo strapped a 12 volt battery to the main rails. 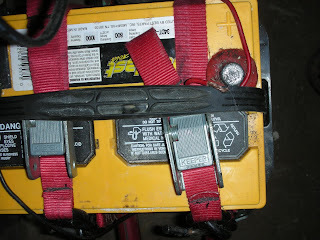 I ran the motor wires up to the battery terminals and connected the negative and black wire together then set the red wire over the positive terminal so when you stood on the post the wire made a connection. I'm not recomendig this (any of it) for people to do, but I could go about 10MPH for about an hour and a half, only on fairly level ground. I used it 7-10 times for trips between 5 and 8 miles before I burned the brushes (smoked the motor) tring to climb a small shallow grade. I was lucky I was only a half mile from home when it went. Still this was enough to prove to me at least that I wanted another electric scooter that was faster and less JANKIE. I haven't blogged in quite a while so here is some interesting stuff, only if you are following the story of Fritz and Heinz. These are pictures from the photo album. Heinz's bike is so new, Christmas 1957, that boosters haven't been put on the pedals yet. He needed boosters because even with the seat all the way down, he couldn't reach the pedals. He could start by himself but not stop, so he would call out "Catch me the next time around!" and Gramps ( we called him Dad then) would snag him before he fell. 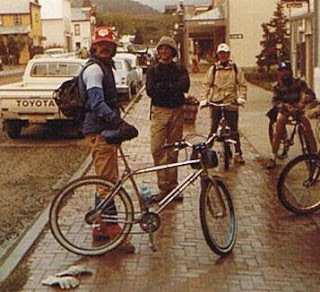 This one is 1982, in Crested Butte Colorado during FAT TIRE BIKE WEEK . 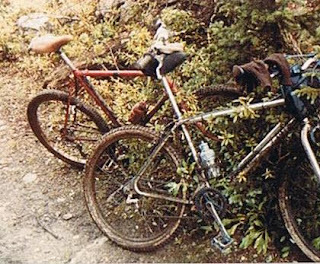 The bike Fritz is behind is CRO-MO and it eventually became Old Grey. At 8,700 ft after a week of acclamation Fritz is still huffing just to climb stairs to get to a second story bar. Notice Main street is not paved that happened some time later. 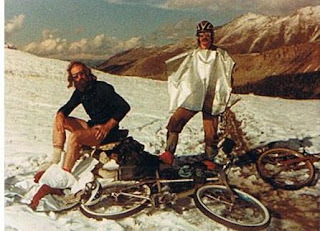 During that same trip to Colorado some days later Heinz and Fritz take a break at the top of East Maroon Pass, the storm had blown through only minutes before. Note the Space-blanket Poncho, a real lifesaver. What you don't see are the plastic bags over our socks to keep the water out when doing water crossings. In this adventure (I think it was on Oat Hill Road) we got a little muddy, but the trail wasn't dusty like in the summer time. 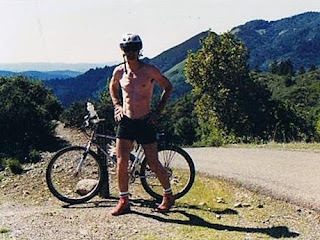 After the run we would ride into town to the spa, hose off and spend some time in the hot pools. On this camping trip Oat Hill in the summer Gramps came with us, at the time he was over seventy. It was a great ride, our sister and her kids came along. When we got up in the morning we could look out over the cloud layer in the valley and see the tips of the golden gate bridge sticking out of the cover nearly sixty miles away. Fritz and CRO-MO on Mt. Saint Helena in the summer time. 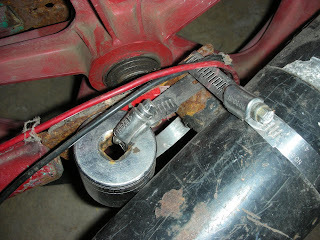 This is after the other pics of CRO-MO because you can see where center pull brake mounts have been welded to the forks. More on sidecar bikes later. First we'd like to welcome all of our sisters readers from HOME POWER. HI, you know a little of the back story so this post won't be to weird I hope. 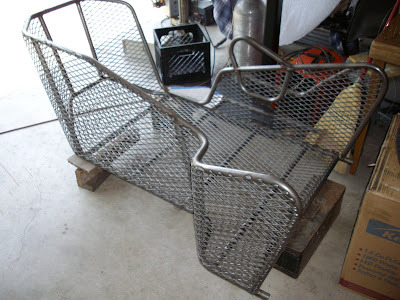 Both Fritz and I have been working independently on the deeper (psychological) side of sidecar construction. So what I'll do is lay out Fritz's philosophy first and then mine. So if you got questions just ask. It is a difficult task for some to be creative. Creativity is not something that can be forced, it must be allowed to flow. If this sounds esoteric, it is. For us, the designs are developed separately in our minds, we think the problem over. We ponder the small details, consider absolute necessities, make running changes and formalize individual concepts. Then we get together and discuss our ideas. Simple sketches are used to relay specifics. In this process there is a lot of listening and verification that we really are hearing what the other is proposing. Occasionally a thread of thought will arise, we will follow it (allow it to lead us for a while at least). Part of the process is to reject or retain an idea or concept. This is where we list to each other the plusses and minuses then reverse roles. Our egos have to be prepared to let go of a cherished concept or embrace one that didn’t look that good before. Sometimes one of us will talk himself out of a pet idea. We lay out to each other any new specifics that are unique to the current project. It is already agreed that features which have proven themselves in the past, will move forward without contest. If anyone of these proven concepts must be discarded that requires special justification. We are then to the point that an outline of the new concept in clear in each of our minds and there are very basic sketches of features and general shape. These are not written in stone. 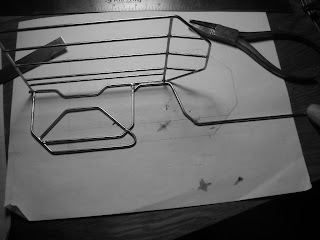 At this point we begin the wire frame model. As we progress on the model there are opportunities to add or revise features that present themselves, such as integrating a lock box or shelf inside of the side car. This concept went through three revisions to date. 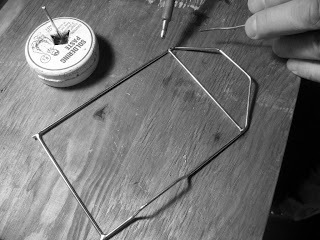 Trying bent shapes and their spatial relationships, merits and faults are a good use of the wire model phase. 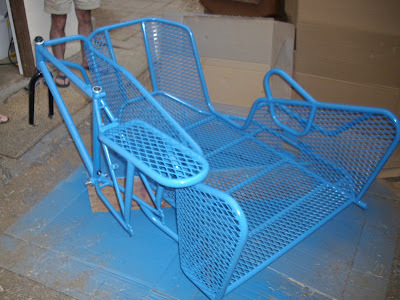 It is also where, once the general shape is solid, details are tried for how they look or fit. Now the styling begins to show through. The fact is that some things just look wrong and minor adjustments in shape or placement can make them look right. Let’s face it, how something looks is very nearly as important as how it works. In the case of the Proto III we visualized a top rail that was a flowing line with no interruption. In final form that flow was integral to its personal style. It is interrupted in a few places, but done so that the eye is not drawn there. That top rail really is three tubes. That reformed shape is still in functional, i.e., high inside wall, high front, rearward leaning tail fins. We didn’t know exactly how these things would be until we did them and that’s the magic of creating new ideas. The entry opening was a feature that I, Heinz didn’t want. It would not be as clean and flowing as my wire model original. Fritz was adamant, it needed a door. I was also worried about it’s compromising the strength of the basket. We argued the merits/ disadvantages. I drew a sketch of it with a possible entry shape, partly to show Fritz how bad it would look. Problem was it looked good, very good really. I hate that, but then I love it too. That means it was obvious that we just needed to ensure that the doors shape was one that retained the baskets strength. We did this by using large radius corners and outward leaning side elements. In this phase questions are answered, but more questions arise as well. You can define creativity as addressing all these questions. By allowing the mind to “turn over” these ideas while driving, working, riding the process tends to move along. And, when looking at the world around, if you can see analog designs and how you could use them is also beneficial. I’m not saying copy things, I’m saying be mindful of what’s already been done. Sometimes a single concept is a jumping off point for a whole new design concept or cleaver feature. 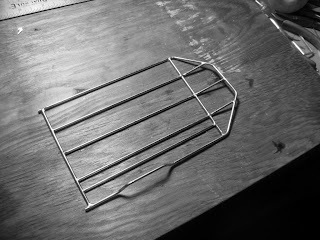 Recently while looking at the Proto IV wire model a thought came to mind for the front basket design. It was to try a front opening shape akin to a F16 intake mouth or a 427 Cobra front opening; a slanted forward loop with a stay that has a flowing shape rearward from the leading edge. Putting this on a wire model will tell us more. It can not be illustrated enough that if one feature can be solidified, or even quickly sketched, then sometimes an entire concept “grows” from that. Conversely remember if a concept is too difficult to integrate or even looks wrong you must be prepared to discard it. 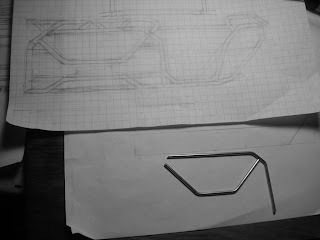 Making a second more detailed drawing, after the general shape and some details are solid on wire model, is much easier. This will also be more realistic in terms of the appearance of the bends, the proportions, and the drawn relationship of the tubes. This makes it easier for us to visualize how we need to change the wire model to get the look and features we want. 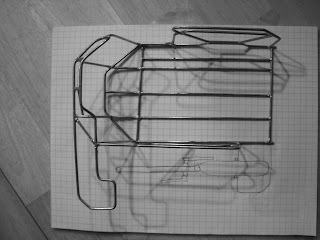 It is then a continuance of trying bent shapes previously visualized or thought up on the spot while pondering (starring at) the wire model. Options present themselves and they are used or not and the secondary details like shelves, bracing, floor design fall into place. We will discuss the merits and drawbacks of any newly found feature. Refinements can occur in this phase without working on the model. Then back to drawing single features or trying bending shaped and simply holding them up and moving them around until they “look” right. When we arrive through trial and error on a model reflecting the features, function, style, and construction that we like, we stop and think the whole thing over for awhile. We discuss details of features we have named, maybe make physical changes but generally get prepare to render the model in full size tubing. This is as much as we can articulate on this subject, at this time, just remember, that it’s a process that takes time, mindfulness and effort. Look to just about anything for inspiration, ask questions, think out loud and do whatever you need to do to move forward. Don’t be afraid of perspiration. 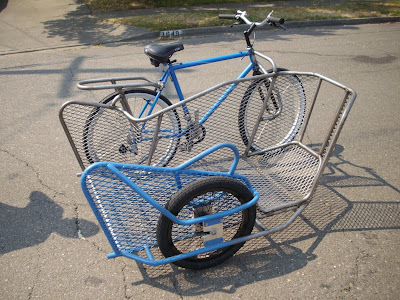 Having some experience with cargo style sidecar bicycles (please note all of the qualifiers) we may be able to help you conceptualize your vehicle. First let us think about widths, over all, wheel to wheel, basket and pedal clearance. I’ll work these backwards so we wind up with the overall. I have a size 12 wide foot and I like toe clips so for me a centerline of the bike frame to the centerline of the inside basket frame tube of 10.5 inches gives me the clearance I need. 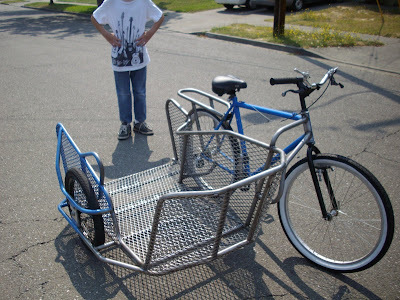 Next I chose a basket width of just over 2 feet, this width allows a standard width wheelchair to fit inside (25.5 inches) and a bike wheel to sidecar wheel distance of 40 inches, because that allows me to ride on most standard sidewalks. Adding all this up gives us just under 4 feet for the total clearance width (Left pedal to outside sidecar tube) the handlebars can be rotated and the vehicle can squeeze through most cycle path barriers. Our platform is 5.75 inches high in back (so dropping off a curb you do not drag) and 6.75 inches in front so when it gets loaded it dosen’t sag. It also has a 52 inch long platform of which 40 inches is flat (the front lifts slightly). The outside wheel axle center is about 3.5 inches forward of the rear wheel of the bike. On the White Wizard the outside wheel is more forward and that did not work as well (the balance when loaded seems off). The Blue Ferry has some features that are extremely nice. The elevated inside wall keeps riders hands away from the pedal action and the entry opening makes it much easier for limited mobility riders to enter and exit. 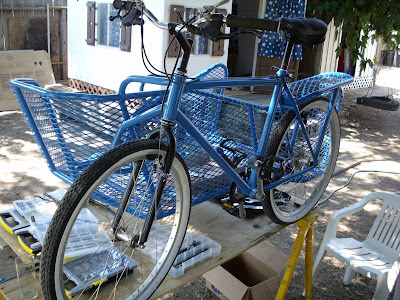 The rear rack (20 inches long behind the seat tube) is strong enough to use as a jump seat and forward rake on the front of the basket (29 inches above the ground) keeps people in crowds from getting there heels clipped (they may get bumped by the basket if the driver is not very careful). The White Wizard has a superior design (by comparison to Old Grey) for deflecting objects struck by the right side of the vehicle The angular clipped outside front corner of Blue Ferry is even a better improvement, that space is almost useless for cargo and inhibits right hand turns. The inside corner is clipped back also giving more room for front wheel clearance. All of our vehicles have permanently attached sidecars and they are attached at 2 points both front and rear. We also attempted to triangulate our attachment points as much as we could. Strength and dependability have been proven out by Old Grey having used it for ten years now. 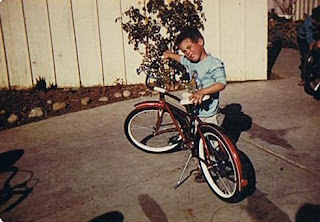 The wheels are one of the most important features of the bikes. The side loads compared to a regular bike are incredible. Heavy gauge spokes and high quality rims (not necessarily the lightest, thick single wall aluminum rims in 1.75 width from the early 80’s by ARAYA or UKAI have worked well for us)) are obvious, but strength is also gained by using thick wide spaced flange hubs and a three or four cross spoke pattern. 36 holes or more is a great idea; in fact the 20 inch outside wheel on the Blue Ferry is a 48 hole. Along the same line is tire choice. You should choose tires before welding frame to bike, a different tire size could tilt your bike left or right or your sidecar forward or back. Be sure to consider wear when choosing tires a flat profile tire (of the same compound) will wear longer but a round profile tire will have less rolling resistance. Another thing, that outside wheel is going to run into things at speed with weight. To prevent rim pinches we took a thorn-proof tube, slit it along the inside center, cut out the stem and pushed it up into the tire. We then put in another Thorn-proof tube and (carefully making sure the bead was well seated) pumped it up to over 75 PSI. Coincidentally higher pressures will give you lower rolling resistances and won’t flatten when loaded. We use the tube-in-a-tube idea for our main wheels to and run them over the rated maximum pressure as well. Gearing up does not seem that important (speeds over 25 MPH start to get weird, I have had Old Grey up to 28 MPH with about 150lbs in the sidecar, more on that later) but getting a low enough gear to pull a heavy load up a hill or across a field can be a trick. We used a (compact drive) double chain ring up front (the third chain ring is used as a chain guard) and the largest rear sprockets imaginable. The two largest of the rear sprockets are close spaced with a gap before descending regularly down to the highest gear. We are not completely satisfied with the brakes on our bikes. We think they need killer discs. But we do have an arrangement of brakes that we do like. That is using the left hand for the front like usual, but on the right hand we have two levers the upper one controls the rear bike tire while the lower one controls the sidecar tire. Sometimes you want to brake one side only. There are other arrangements we will get to later. 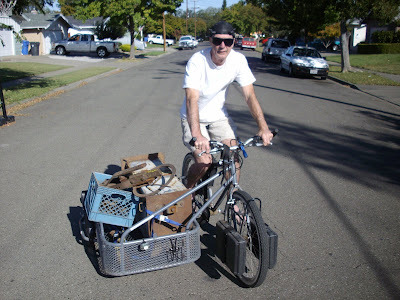 So you can see that this is no ordinary bike, If you thought you were going to hook a cargo platform up to (just any old bike) and load it up to the max, you should probably head back to the drawing board and do some revisions. Mind you I’m not saying it won’t work but in our experience if a problem can crop up it will be at the most inconvenient time, so don’t just look before you leap think about how you want to land. The pallet of primary colors red, white and blue are for our American heritage and the forge colors of bronze, grey and charcoal should convey the tradition of shaping of components into useful tools. The grey outer edge of the shield is representative of our original sidecar bike (OLD GREY PROTO I). Each of the three stars white, blue and red are references to the series of prototypes (The WHITE WIZZARD PROTO II), (The BLUE FERRY PROTO III) and as yet not completed (The RED RIDER PROTO IV). 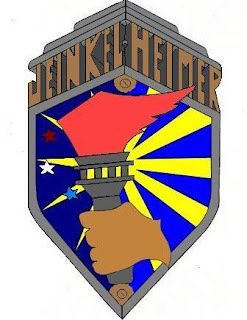 The name JEINKEL- HEIMER in bronze at the top is high, proud and tall. The iron grey torch is emanating light into the day on the right and into the night on the left. To carry the torch is to remember the history of cycle manufacturing. The fire red wing shaped flame symbolizes motion with the torch in hand pushing back the night. The flame and hand escaping from the background is showing that they are too powerful to contain. In fact the overall impression, like the three receding steel grey chevrons at the top, is meant to evoke the art-deco era of old. 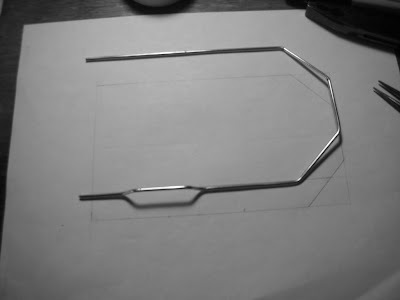 We are collecting tubing, frame, components and ideas for PROTO IV. The first thing we will do is list our wants i.e. Then develop a list of things we would be willing to sacrifice. 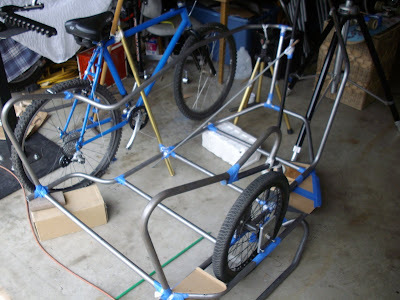 When we are satisfied with the look or concept (many wires have been removed /moved and or replaced) we will lay out the base of the sidecar in full size (measurements just got critical) on the floor in chalk. The base is formed. 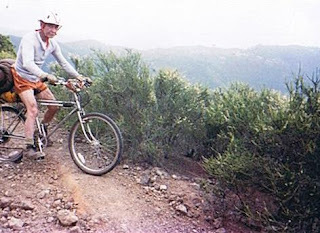 It is time for the bicycle side top tube so refer to the wire model and go for it. Prop it up in place and fit in the uprights. 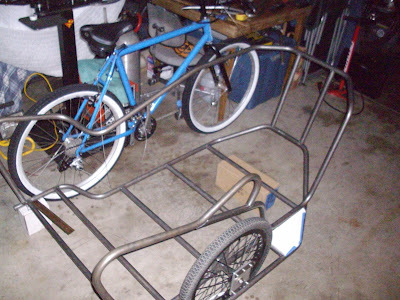 Move right on to the outside top tube, this one has the door in it and the outside wheel support. 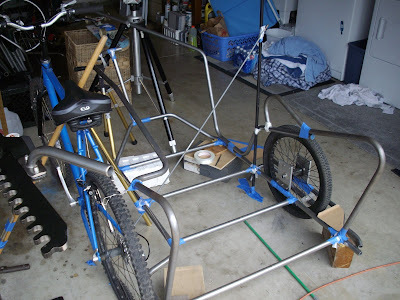 After it is in place with uprights it will be wheel supports followed by grab handles. 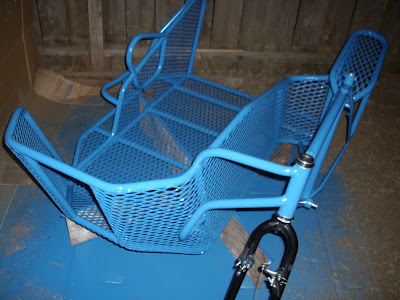 What I have not mentioned at all yet is the donor bike we need to have already removed paint from the locations where welds will be attached. 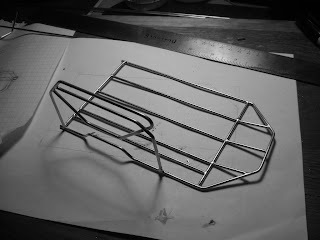 For PROTO IV integral racks are an important part of the design concept. 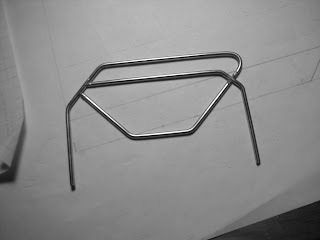 The outside edges of the racks (both front and rear) will be where the sidecar attaches so rack mount triangulation is extremely important. 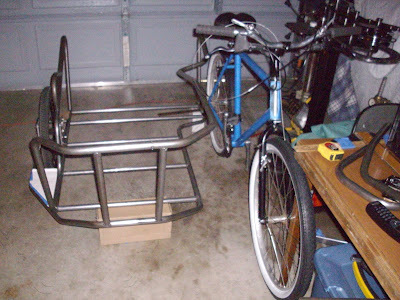 Forming the racks will be similar to forming the sidecar but mounting to the bike and having clearance for pedaling and turning can not be overlooked. 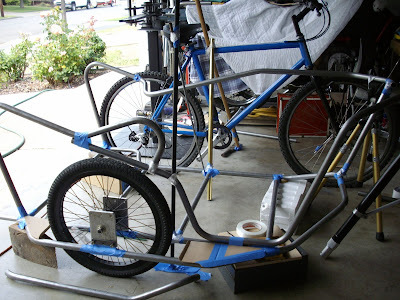 With the bike propped in place next to the sidecar also propped in place the last fabrication component is the bike/sidecar connection (in reality this may at the last minute become a permanent mount) We will just have to see how it goes. As of yet PROTO IV does not have a name, it seems as though we need to see it in order to project a name onto it. You might be wondering what all this sidecar stuff is about, well we wonder that ourselves. We, Fritz an I, have now decided to make available as much information as we have discovered about sidecar bicycles having used them over the last ten years. We intend to present information on the theory,planning, fabrication and testing that it takes to produce a sidecar bike. You might say "Why would we do this ?". 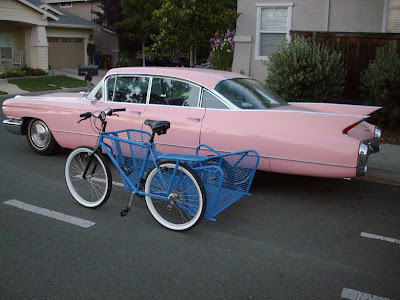 Well we believe that a bicycle capable of carrying 500+lbs, two passengers or long heavy objects has a universal appeal and possibilities that we, in these times, have only begun to imagine. We will strive to answer all your questions and post them as we get organized. You will be seeing new sequences such as Tube bending, Wire form modeling, Joint mitering, Tack welding, Filing, Fitting ,Pattern making, Assembly sequence, Bike gear/brake theory, Appropriate wheel sizes etc....as it apples to bicycle sidecars. The good news for all of you is that though my brother and I can be very "wordy"in person my typing skills are limited. So I promise to stay brief in my replies. As of now we are very satisfied with our progress. And with what we believe is a string of successes in the areas of bending, stability and comfort for both rider and passenger, we fully intend to be informative wherever possible. Every where we go with these machines people say "I was going to make one of these for my dog! or surf board or..." Because of this, we are thinking that there are many others who have pondered these types of vehicles and might appreciate a little advise. If you're like me sometimes a single image or concept will open a whole vault of possibilities. So lets collaborate. Now, ask away! The estimated 30o Lbs of steel for the 175 Lb rider was not a problem but admitedly slower than usual. Out for a ride and what should we come across but a true classic. Note similarity of profile. The fins arent as sharp by design. The first ride, how sweet it is! Note handlebars here are low by comparison to what we wound up with. We really like a more upright position. 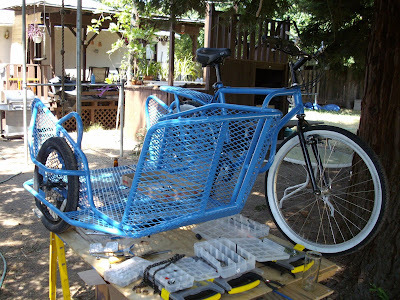 By this time we're realy ready to ride but it still needs brake adjustments, chain and some finishing touches. This view shows some of the features we thought were pretty cool like the entry handle, the rear rack/ seat and the front cage opening for long objects. Two more cans of paint and we're just about there. This after about 4 cans of spray paint. 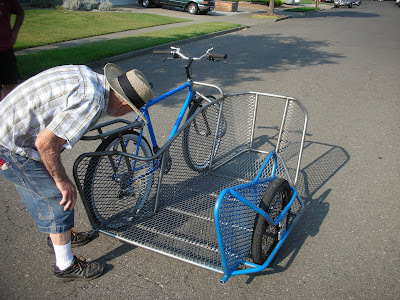 Note rear rack has mesh in it as does entry step. 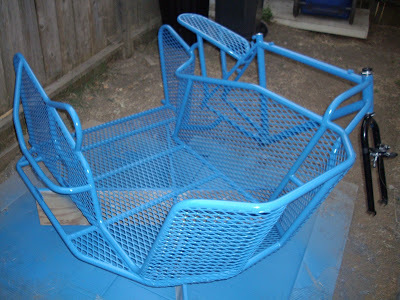 We used outdoor furniture paint figuring it would hold up better. 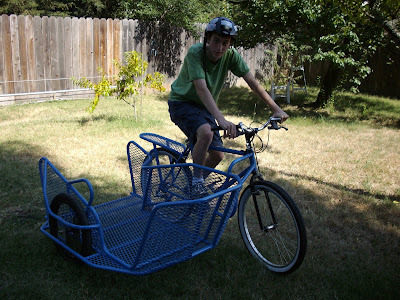 This is a rollable but not ridable sidecar bike. We were so excited we took it out and pushed it down the street just to see how it felt. We were amazed. 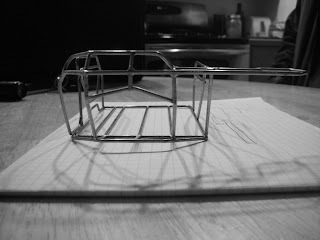 This view shows cage welded to frame. 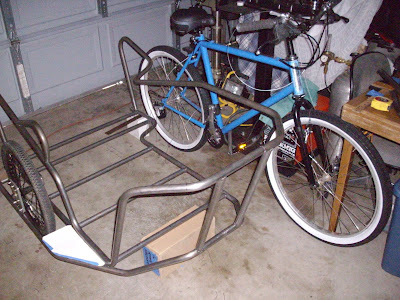 Note beginnings of rear rack and test painting for color match. This view shows the high inside wall and deck flair behind rear axel. This view shows entry top outside wheel supports and entry step plate mock-up. At this time we thought that the step plate would be a solid plate. 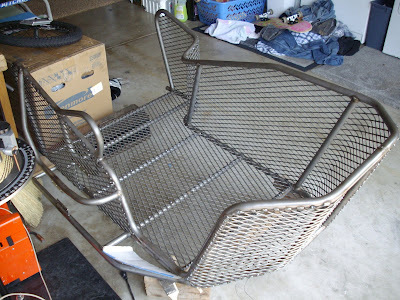 This shows the welded cage with expanded metal skin. 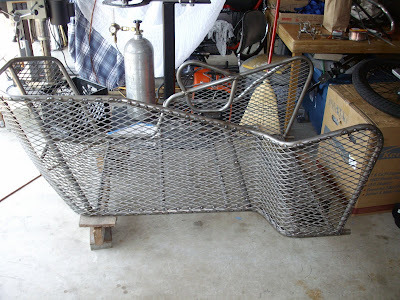 Note welds are unfinished. 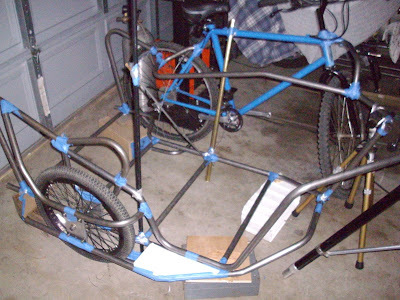 Mock-up showing cage bike seperation. This was necessary to insure sufficant clearence for feet of cyclest. 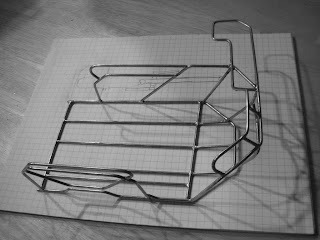 Tacked cage showing paper entry step mock-up. PROTO III major tubes tacked. Note no inside uprights, no upper outside wheel supports. 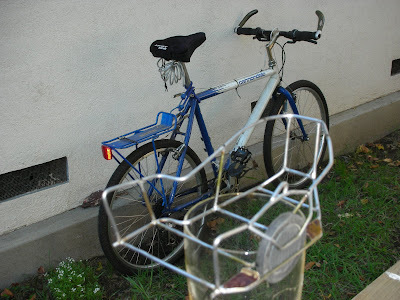 Further mock-up of bike attachments.Note upper rear attachment that was not used in final form. 3/4 view .Note blocks supporting frame. Gramps inspecting PROTO III welds. Note no skin on rear seat/rack or outside wheel step plates. Gramps as a young man worked as a welder at several places. 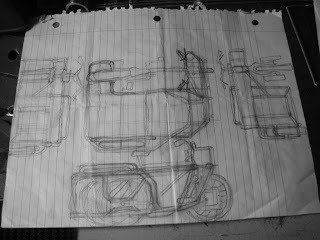 A little trick photography allowed us to visulize the general shape of sidecar and bike. Note beer stien holding wireframe.